Cafe BG in Bergdorf-Goodman, New York City’s epitome emporium of chic and The Berkeley of London have combined forces to present the ultimate three-course afternoon tea. When the craftsmanship of couture meets the artistry of haute cuisine the results are fashion week fabulous. The Berkeley’s voguish Pret-A-Portea, while not a new concept, is regarded as one of the most imaginative and popular tea programs in London. Based on the biannual fashion show collections, the menu is tailored to reflect the styles of each season. One can hardly believe the delicate confections are to be consumed and not worn. 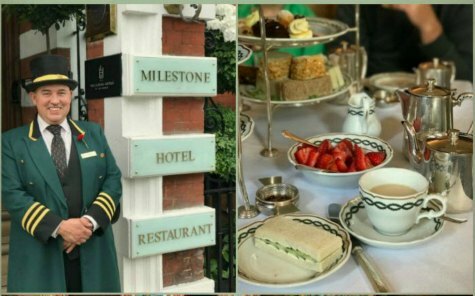 When everything old is new again, once again the English tradition of afternoon tea is updated to accommodate a new generation’s desire to socialize in a relaxed manner. This is the best of all world’s – fashion, food, and fun. 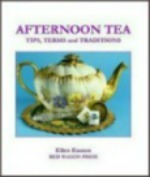 What better way to shop for the latest trends than at tea time? A new elan has begun at Bergdorf’s, as this tea has pizzazz! Cafe BG is a graceful and serene room, beautifully decorated in hues of blue-green with a modern French-Chinoiserie flair. Overlooking Grand Army Plaza at Central Park, one could not have a prettier view of New York. An assortment of five miniature savory sandwiches, with crust’s off, are as appealing to the eye as they are to taste. Each savory item served is made at the time of the order, thus keeping the tuna’s puff pastry from becoming soggy, allowing for finishing touches and hand garnishes. The sandwiches range from the classic smoked salmon and cream cheese with capers on rye bread, egg salad and watercress with chive on white bread, and sliced turkey on cranberry-nut bread, to the contemporary and delicious red beet and cheese spread on whole wheat bread and tuna puff pastry Napoleon. A second course of warm scones with Devon cream and preserves followed. The third course, as inspired by the Spring 2009 designer runway collections, Mourad Khiat, Head Pastry Chef and Eunmi Jung, Pastry Chef of The Berkeley have created a centerpiece of delectable sweets of miniature bespoke cookies and cakes. The virtuosity of these talented chefs is to be commended. Each edible sweet is a remarkable replication of the designer’s wares, as evidence by the photo below. For tea lovers of all ages, in addition to afternoon tea service, the 7th floor candy and tea boutiques are a do not miss. When visiting New York City do make a date with Bergdorf’s!